Stir the soup and milk in a 2-quart saucepan. 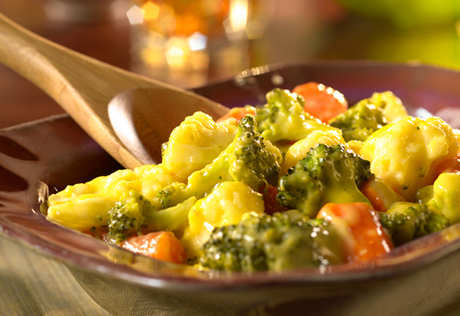 Stir the broccoli, carrots and cauliflower in the saucepan. Heat to a boil over medium heat. Cover the saucepan. Reduce the heat to low and cook for 15 minutes or until the vegetables are tender. I made this recipe but added salt, pepper, garlic and extra cheese. I liked that the vegetables can be cooked to the crispness desired because they start out raw. It did take a bit longer than 15 minutes to cook though. It was nice to have something fast and tasty on a weeknight. Thanks to all who made suggestions. I also thought the cheese soup was a little bland. So I added a little salt, pepper, garlic and extra cheese. I thought I had some shredded cheddar cheese, but I only had the four cheese blend. I used that and it came out great. The whole family loved it. This was very easy to make & quick. My husband thought it was plain tasting, but my oldest son loved it. I'm going to try & add a shredded cheddar cheese at the end to give it a little more flavor for my husband, the next time I make it. This tasted awful. Not a very good "cheese sauce" substitute. Very Good. Better than my old recipe.